Description: Course muslin buff with a shellac center is 3" diameter with 4 stitched rows.. For use with abrasives such as tripoli or emery. 35 ply. Description: Course muslin buff with a shellac center is 4" diameter with 4 stitched rows.. For use with abrasives such as tripoli or emery. 42 ply. 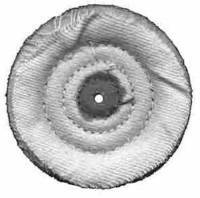 Description: Course muslin buff with a shellac center is 6" diameter with 4 stitched rows.. For use with abrasives such as tripoli or emery. 50 ply. 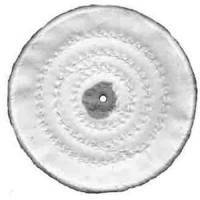 Description: Fine muslin buff with a shellac center is 4" diameter with 4 stitched rows.. For use with polishing rouge. 50 ply. Description: Fine muslin buff with a shellac center is 6" diameter with 6 stitched rows.. For use with abrasives such as tripoli or emery. 60 ply. Description: Chemically treated yellow fine muslin buff with a shellac center is 4" diameter with 3 stitched rows. 40 ply. Holds compounds better than most buffs. Description: Chemically treated yellow fine muslin buff with a shellac center is 6" diameter with 4 stitched rows. 50 ply. Holds compounds better than most buffs. Description: Cotton flannel buff with a shellac center is 3" diameter. 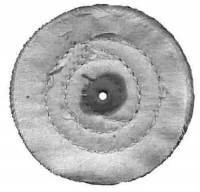 For use with abrasives such as tripoli or emery. 30 ply. Description: Cotton flannel buff with a shellac center is 4" diameter. 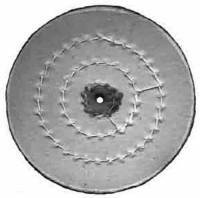 For use with abrasives such as tripoli or emery. 30 ply. Description: 1/8" shank reinforced head mandrel. Made in India.